A good discussion of the properties of nerves and the Hodgkin–Huxley experiments is found in Katz (1966). Why do we cite a book that is over 50 years old? One reason is nostalgia. In 1982 I graduated from the University of Kansas with a physics major and entered graduate school at Vanderbilt. I began working with John Wikswo, who was measuring the magnetic field produced by a nerve axon, so I had to learn quickly how nerves work. One of the first books I read was Nerve, Muscle and Synapse. What a lucky choice. The author, Bernard Katz, led an interesting and productive life. Because of his Jewish background, in 1935 he fled Germany for England. There he worked with physiologist Archibald Hill (Katz dedicates Nerve, Muscle, and Synapse “to my friend and teacher, A. V. Hill”). He collaborated with Alan Hodgkin, and was a coauthor on one of the five famous papers from 1952 that established the Hodgkin and Huxley model (see Chapter 6 of IPMB for more on this model). He also published a paper with Hodgkin about electric current flowing through a membrane, leading to the Goldman-Hodgkin-Katz equation discussed in Sec. 9.6 of IPMB (Goldman derived this equation independently of Hodgkin and Katz). 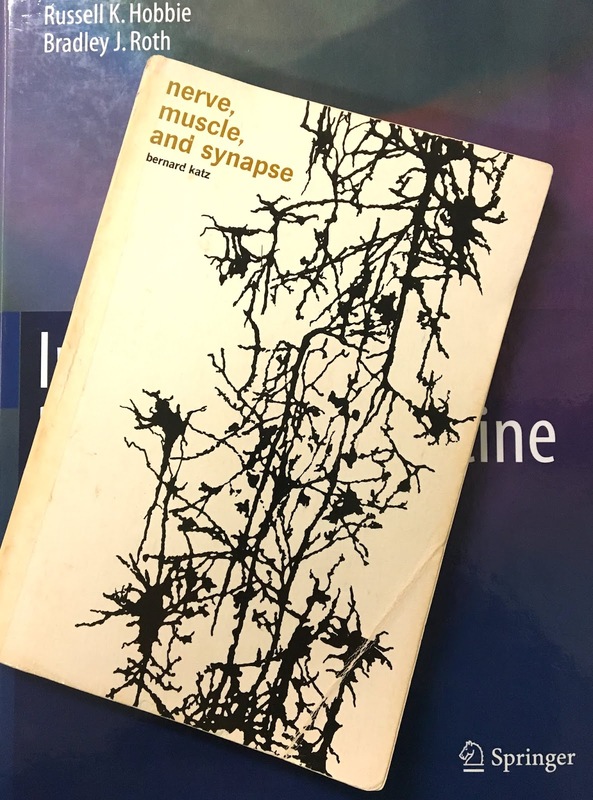 Katz won his Nobel Prize for discovering the discrete nature of acetylcholine release at the nerve-muscle synapse, which explains the book’s title. I was glancing through his Chapter 9 on the Quantal Nature of Chemical Transmission when I saw an example analyzed using Poisson statistics and I thought to myself “Hey, that looks familiar.” His example uses the same data that Russ and I present in our Appendix J about the Poisson Distribution. We had a common source: IPMB and Katz both cite work by Boyd and Martin. Professor Katz has produced here the elementary text we asked of him, but also much more. He goes far beyond the first essentials to develop the subject in depth. He has the gift of a graphic style and the apt phrase. What impresses me particularly is that each idea is pursued to the numerical level. Each theoretical development comes out in this form, in clearly stated problems worked through with the relevant numbers. But the treatment as a whole extends beyond this also, asking and answering the basic questions that few workers in electrophysiology probably have taken the trouble to pursue so far. All this is done with an easy mastery of the underlying physics and physical chemistry. That’s high praise. Russ and I take a similar approach in IPMB, pursuing topics to the numerical level (sometimes in the text, and sometimes in the homework). Nerve, Muscle, and Synapse shares another trait with IPMB: it uses calculus without apology. If you are looking for the most up-to-date textbook on nerve electrophysiology, you should search for a more recent publication (perhaps the latest edition of From Neuron to Brain). But, if you’re a physicist trying to learn something about how nerves work, Katz’s book remains a useful introduction. That’s why Russ and I still cite it.